The Hard Drive Live 5 Tour roared into Pittsburgh last night, bringing to Stage AE four bands that could be considered "hard rock," but certainly ran the gamut within that continuum, from pop-rock to neo-thrash. Regardless of the diversity among the bands, the combination made for a night of beginning-to-end fun with no shortage of mayhem. First up was Stars In Stereo, a new female-fronted pop-rock band whose sound is what I'd imagine Avril Lavigne to sound like if she didn't care about radio play. The band started off their set with some deep cuts from their debut album in a sort of feeling-out process between the crowd and the band. The band didn't look confident and the crowd didn't seem receptive. But that all changed when Stars In Stereo ripped into their cover of Aerosmith's "Dream On." The crowd responded with a roar which, in turn, seemed to energize the band to bring their A-game. Their next several songs, including my personal favorites "All Together," "Violence," and "The Broken," featured some amazing stage presence, including some crazy-high spinning jumps from guitarist Jordan McGraw. The star of the show to this point, however, was vocalist Bec Hollcraft who was equal parts hot, modest, and talented. While I don't think that Stars In Stereo's debut album is strong enough to catapult them to being a household name, last night's show displayed the youth and potential to make the band a rock force to be reckoned with in the years ahead. Remember the name: Stars In Stereo! Next up was Young Guns. I was not very familiar with this band before the show. I streamed some of their music to prepare for the night, but was not impressed and could not push myself to give them a good, honest, full listen. Fortunately, you don't need to be familiar with this band's catalog to enjoy their show. If Stars In Stereo has A+ stage presence, you could easily say that Young Guns has A++ stage presence. They kept you watching and were great at inciting crowd participation, including a sequence where they had everyone holding on to their neighbors' shoulders and jumping to one of their songs. They kind of reminded me of a lighter version of Taproot. Their set ended with their song "Bones," which was an easy tune to sing along to. Then came the moment that I was personally waiting for...Halestorm! The band kicked off their set with perhaps my favorite song of all time, "Freak Like Me." If the band was merely smoldering for that first song, they were undoubtedly blazing like an inferno on the next tune, the Grammy-winning "Love Bites (So Do I)." Keeping the attention on their latest release, The Strange Case Of..., they segued into the always-appropriate "Rock Show" before throwing long-time fans a bone with "It's Not You" from their self-titled debut. Everyone who smartly spotted the piano/keyboard on stage left knew that "Break In" was coming at some point and, sure enough, it was time for vocalist Lzzy Hale to chase her bandmates off the stage to begin the intimate ballad by her lonesome. But a bit of a surprise was in store as, after the first verse, drummer Arejay Hale, guitarist Joe Hottinger, and bassist Josh Smith returned to the stage to morph the performance into a two-song medley by switching gears into "Familiar Taste of Poison." Arejay Hale's drum solo followed and, true to form, he always seems to pull out a surprise, even for those of us who have seen Halestorm innumerable times. This show's drum solo surprise was a piece that featured him executing four jumps during a beat and, on each occasion, returning to resume the beat just in time. And these were no small jumps: the crowd could see his feet above his drum kit! Following Arejay's drum immolation, the band roared through four more of their most popular songs - "Mz. Hyde," "I Get Off," "Here's To Us," and "I Miss The Misery" to a raucous response from many in the crowd who were there mainly to see Halestorm. Halestorm is a band that never disappoints and tonight was surely no exception! Bullet For My Valentine waited in the wings and drove the crowd into an unprecedented frenzy with their opening song "Breaking Point" from their latest album, Temper Temper - definitely one of the best rock albums thus far this year. Though mixing it up a bit, the early part of their set seemed to lean towards Bullet's newer material, with "Riot" and "Temper Temper" being highlights. The crowd ate it up - there were more simultaneous crowd surfers than I ever saw at any similar sized venue. 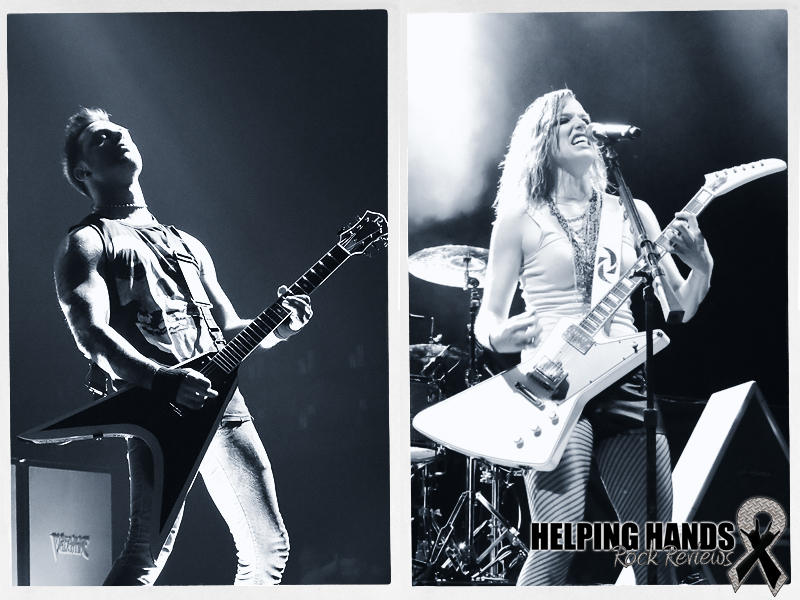 The second half of the set featured more classic B4MV material, though they fired up the crowd a little more by bringing Lzzy Hale back on stage to perform new song "Dirty Little Secret" as a duet with Bullet's Matthew Tuck. The rest of the night was a blur as Bullet continued to onslaught their faithful with their powerful neo-thrash that had the crowd going wild and never seeming to get enough. At the end of the night, the Hard Drive Live 5 Tour proved to be an incredible evening of music and the diversity of the bands made most of the frenzied fans in attendance feel two things: (a) that there was no way of having too much of one good thing, and (b) they got their money's worth from four top-shelf quality bands.